We are back in Panama City at the Plaita anchorage. It's so good to be back in Panama again. We got here on the 5th after an all day trip from the Perlas Islands. The wind was right on our nose so we ended up motoring the whole way. It's good to be back in a town with such great shopping. First thing we did was go to the grocery store and get food. The next night we got together with S/V Otter Bruce and Phyllis , S/V Freezing Rain Don and Marie and went out for dinner. Boy it was good to be back in Panama. We went to Bennigans and I had the best fish and chips. You just can not get fish and chips in Ecuador. You can get fried fish but there's nothing like fish and chips. It's just not the same. Today we are all getting together and checking in. 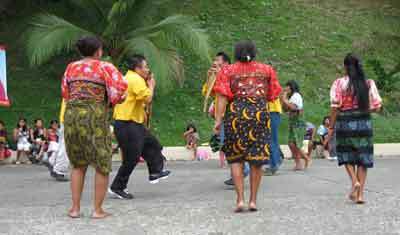 The last 3 days have been a holiday in Panama (Martyrs day) so the immigration and Port Capt. have been closed. Your not suppose to get off the boat till you check in but there's no one really checking on you so no one really does that. But today we will be legally checked in. Happy New Year. We are still at Espritu Santos in the Perlas Islands of Panama . It's just to beautiful to leave. Presently there are 10 boats anchored here. 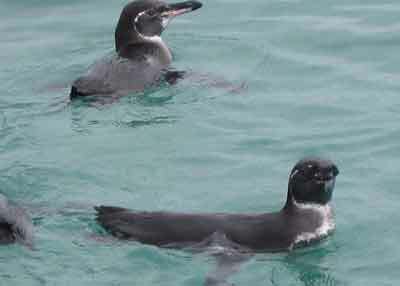 We have been hanging out with Bruce and Phillis on S/V Otter 2. They had left Salinas Ecuador the week before we did so we met up here to celibrate the holidays together. Last night 5 of the boats in the anchorage got together for a bon fire and pot luck to celebrate the new year. 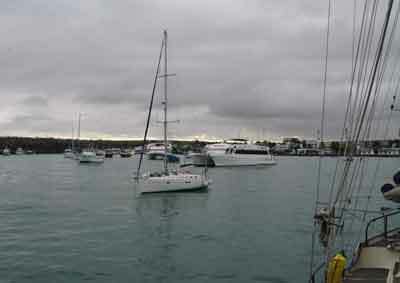 Espirtu Santo anchorage (RDreamz is the 3rd boat on the left) . Phyllis and I getting comfortable and setting up for dinner. 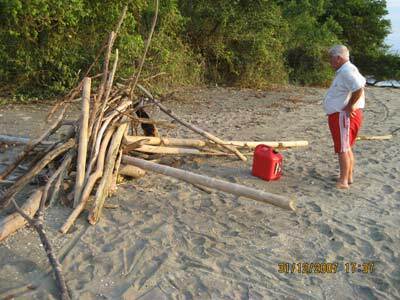 playing bocci ball on the beach and getting the fire wood together for the bon fire. We are now all settled in to our new anchorage. We had a nice trip from the Coco's anchorage to the Espritu Santos anchorage. This is a very well protected anchorage that's very popular with cruisers. You are between two Islands in a small channel. The water is calm and there's very little swell so no rock and roll. The Islands have parrots the squawk all the time and fly from one Island to the other. There are tons of fish jumping out of the water first thing in the mornings and just before dark. Because of all the fish jumping there are tons of pelicans dive bombing the water to get to the fish. There's a lot of splashing going on and very interesting to watch. We have the awning over the boat so we have shade, a cool breeze blowing thru. There are no bugs (boys that's a big one) This is paradise. The only down side is it just does not feel like Christmas. I am making cookies but other then that I'm not putting out any decorations. It's just to warm to be Christmas. 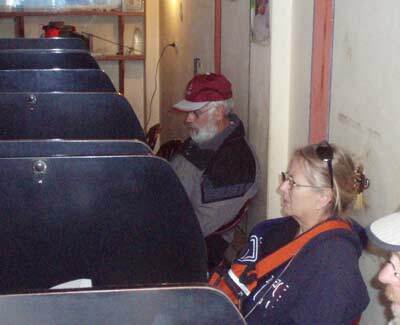 WE have been invited over to S/V Otter 2 for a Christmas dinner so maybe that will help make it feel more like Christmas. Anyway we will stay here till after New Years. I'm hoping to do some diving while we're here. I plan to find some lobsters for Christmas dinner. Since Royce doesn't like lobster he'll have to settle for chicken. But of course if I don't find any lobsters I'll be settling for chicken as well. Time to catch up on what's been happening since we got back from Peru. The first couple of days we just got lazy and did nothing. After that it was non stop work. During out trip we had decided that we would go back to Panama when the boat went back in the water. Some of the reasons for that was visa issues. We had to be out of Ecuador by the end of Dec. You can only stay in Ecuador for 6 months then you have to leave for 6 months before you can come back. The end of Dec. was our 6 months. 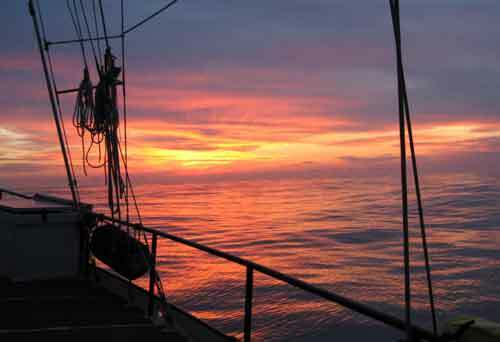 The best time to sail to the South Pacific is March, April. 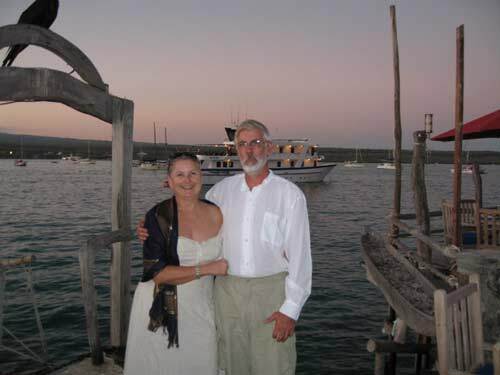 We had hoped to leave Salinas and go to the Galapagos for 6 weeks then we would be close enough to the right sailing time to leave for the south Pacific. 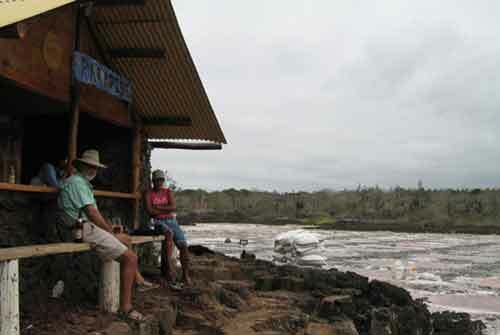 We where not able to get a 6 week visa for the Galapagos. The best we could get was 20 days. This 20 days was also going to cost us $900 thru an agent. One other option we had was to take the boat to Chile. Dave and Candy on S/V Endeavor opted for that plan. Chile would have been nice but it's very cold there and we have been trying to stay away from the cold. So with all the info we decided to go back to Panama till the end March. With that decided we put the speed on to get the boat back in the water so we could be in the Perlas Islands for Christmas. The date was set for Dec. 3. That was changed to Dec. 7 and finally we made it back into the water. Everything worked as it should. We got the water maker all hooked up and working. Royce finished up what needed to be done with the rigging. We payed all our bill's with the yard and waited for the agent to get our paper work back to us so we could leave. On Dec. 11th the agent brought our paper work and 30 min. later we dropped the lines and left Salinas behind. After 6 months on the hard it was so good to be back on the water. Better yet there was a 10 to 15 knot breeze so after all systems where check we set the sails and turned off the motor. For the next 639 miles we sailed. The motor was turned on to recharge the batteries and other then that we sailed the whole trip. 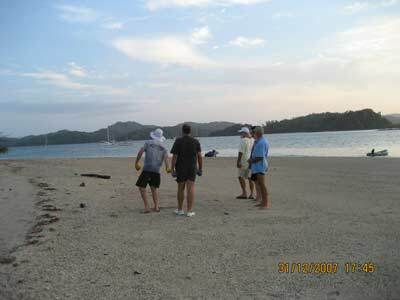 We arrived in the Perlas Islands Monday the 17th. Our first stop is Punta Coco on Isla del Rey. The anchorage is open and a bit rolly bust after 7 days of sailing it felt wonderful to put down the anchor. We got hear at 1500 had dinner then turned in for some well deserved rest. Today is the 18th and it's raining. Royce is still sleeping , trying to catch up on all the sleep he missed. We'll stay here one more day and then we'll start heading to Isla del Espiritu Santo. We used this anchorage the last time we where in the Perlas and it's very calm. We'll plan to stay there for Christmas. 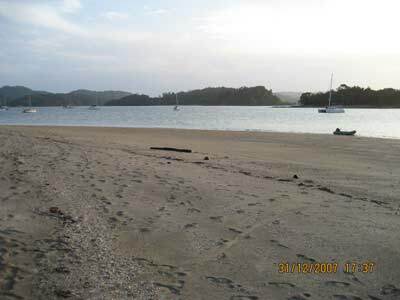 This anchorage is a good jumping off place for taking the dingy out to explore and dive. We will also be meeting up with several other cruisers and hope to share Christmas with them. We're back from Peru. For the next 2 or 3 days we're going to do nothing but rest. It was a whorl wind trip with a lot of sights and a lot of miles. 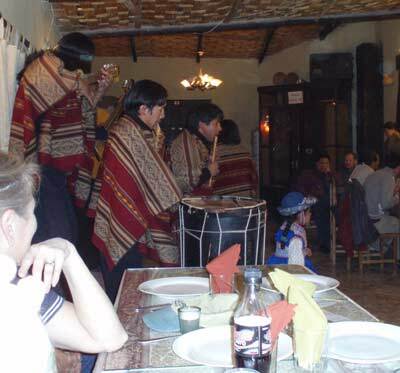 The last week we where in Cusco Peru , I ended up with altitude sickness. I had a heck of a time breathing and was in bed for a day. All was not bad as we had cable TV in the room so I was able to get my TV fix. Everyone else ended up getting travelers diarrhea, a good dose of antibiotics and pepto bismal and all was better. Lets start at the beginning of the trip. 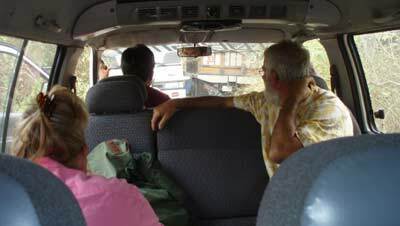 We hired a van to drive us to the air port in Tumbes Peru. It was a 8 hour trip and the van cost us $250.00 one way. 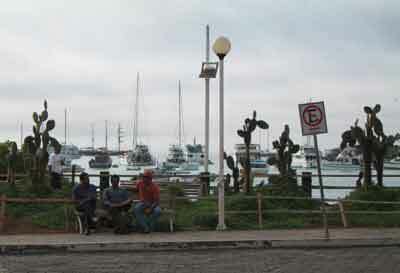 It was a very good deal as he picked us up at the Marina and dropped us off at the air port in Tumbes Peru. Well worth the cost. Our other alternative was to take a 2 hour bus trip to Guayaquile then a 7 hour bus to Tumbes then a cab to the air port. In the long run the cost was about the same and we got there in comfort. The driver even came to the airport when we got back and took us home to the boats. It was very nice to get off the plane and know that he was there waiting for us. No hassle, no wait, no looking for a cab or a bus. Very nice. not about to turn back. 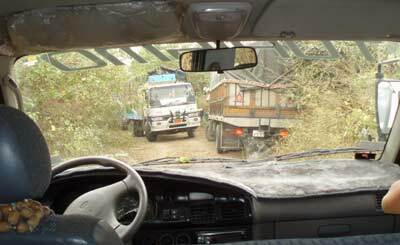 The driver went and talked to a couple of locals and found out there was a one lane dirt road that we could use to by pass the road block. As it turned out we where not the only ones that knew about the road. The problem was we kept meeting other groups of vehicles coming toward us. Since it was a one way road that meant some one had to pull off the road to let the others pass. Several people had to get out with machetes and cut down brush. It was a long detour but we made it with no mishaps. What a way to start the trip. After that it was just a matter of checking into the country and finding the air port. With the detour and the check in we where a hour late to get to the airport for our flight. The plane was scheduled to leave at 1600 or 4 pm. We got there at 1730 or 5:30 pm. We figured since we had missed the plane we would have to spend the night in town and fly out the next day. The driver took us to the airport to buy our tickets for the next day. 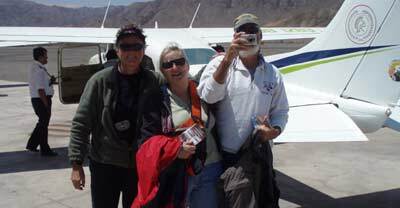 When we got to the airport we found out that the plane had not arrived yet and there was still room on the flight so all was well and we got our flight out of Tumbes Peru. Next stop Lima Peru. Lima was just a short stop over in our trip. 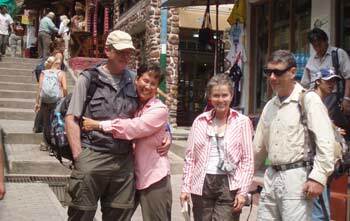 We spent the night and left the next day by bus to Nasca. 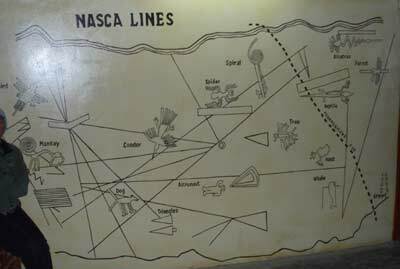 Nasca is known for it's decorative lines drawn on the floor of the dessert. There are over 800 straight lines and 300 geometric figures. 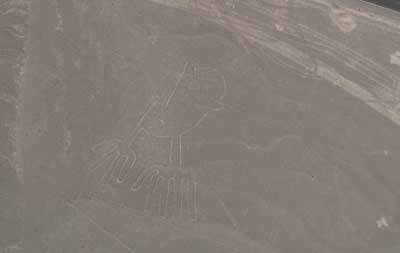 The designs where done by the local Nasca Indians around 900 BC to 600 AD. The lines can only be seen by air and where not even discovered till 1939. When someone flew over the area and saw them.. The picture above shows some of the the designs and our flight plan for seeing them. 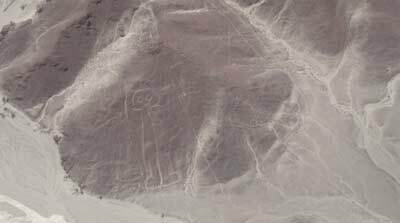 We spent 2 days in Nasca. The flight to see the lines was well worth the trip. This picture is called the astronaut. I'm not sure what this was suppose to be. Probable some kind of bird. The other place we visited was the Chauchilla burial grounds. It was a 30 min. drive to Chauchilla. For $6.00 each we hired a tour van and guide for the trip. In the past the area had been very badly ransacked by grave robbers. 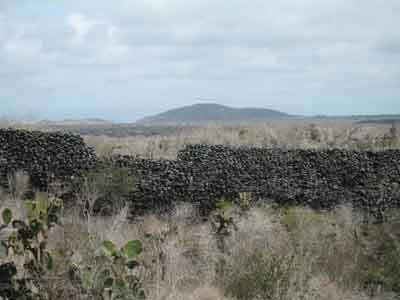 The Government has since taken control of the area and it is now a protected area. 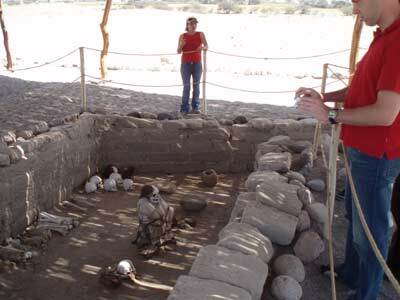 They have cleaned up, and some of the tombs have been reconstructed. This picture is a tomb of some Priests. They buried several people in one tomb. As people died they just opened an existing tomb and someone else in. The bodies where placed in the fetal position and wrapped in wool. They where placed in the tombs with their possessions and maybe a couple of slaves to help them in the after life.. If you look at the picture on the left you'll see on the right side of that picture what looks like rocks laying on the ground. Those are not rocks. That is the cotton that was wrapped around the bodies. 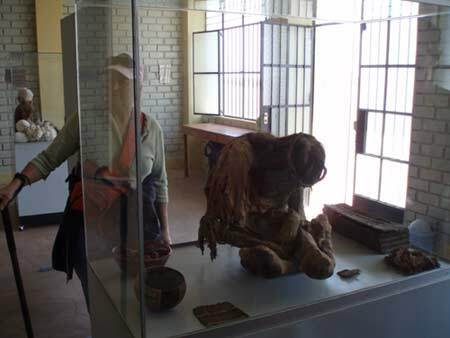 Grave robbers left the wrappings behind after stealing what was in side with the bodies. The weather doesn't really change much in this area so the things left on the ground pretty much stay where they where left hundred of years before. They get bleached out from the sun but they stay in place. It was really amazing to see the hundreds of holes that had been dug by the grave robbers and see the wool wrappings left behind. You also see bones left behind. 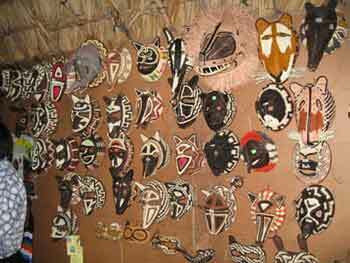 Since Chauchilla has been made a Government protected area everything has been left untouched. They cleaned it up and opened a couple of the tombs for viewing, other then that you see the holes, the wool left behind, the bones and even pottery chards. The next day we went to the Nasca bus terminal to get our bus tickets for our trip to Arequipa. As Royce was being helped at the desk a pickpocket got into his coat pocket and took our camera. It was hard to lose all the pictures we had taken up to this point. Also it was the camera Royce bought me for my Birthday. Luckily Dave and Candy were with us and had lots of similar pictures. Thank you Dave and Candy. Once we got to Arequipa we where able to buy a new camera. Arequipa is at an elevation of 2325 m. This is the beginning of our climb up in elevation. It is also where we first find it harder to breath due to this climb. 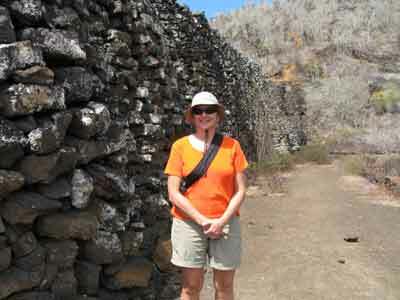 The city is built of the local light colored volcanic rock. It has been called the White City because of this construction material.. It is also a focal point for all the surrounding sites. From here there are snow capped volcanoes, the deepest canyon in the world and a short lay over before heading on to Lake Titicaca and Cuzco. 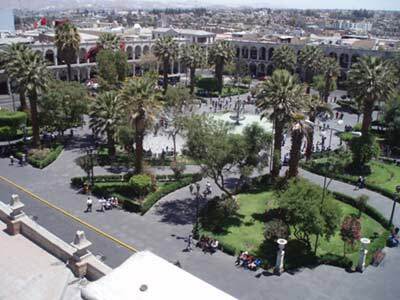 This is a picture of the plaza from the restaurant we had lunch one afternoon..
From Arequipa we planned our trip to Colca Canyon. Colca Canyon is deeper then the Grand Canyon in the US. We arranged a tour that would provide a bus, tour guide, lodging and dinner. The morning of the tour the bus was in an accident. The tour company switched to a 20 person van. There was 18 of us along with everyone's luggage. For the next 2 days it was cramped and uncomfortable. The trip was some of the most beautiful country side we have ever seen. The rock formations where some of the most interesting of the trip. 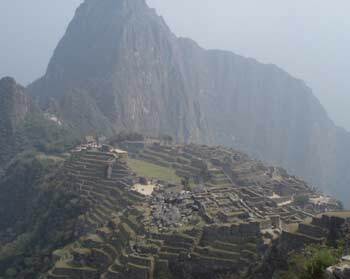 The terracing that the ancient people accomplished where nothing but remarkable and breath taking. 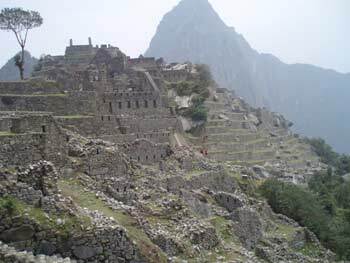 Every place you looked they had terraced, it was truly amazing. The trip was uncomfortable but in the end well worth going. 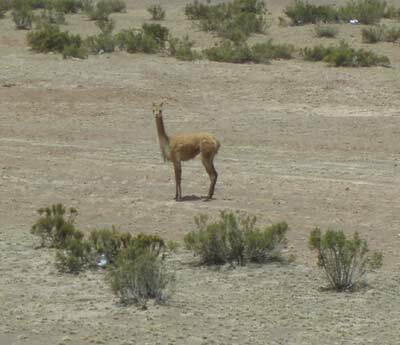 Along the way we saw tons of alpaca's, llama's and wild vicunas. 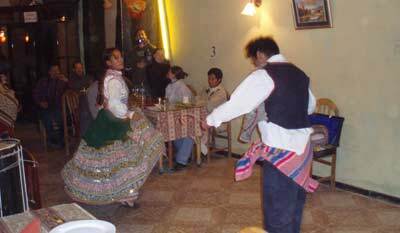 Our stop for the night provided us with a little of the local song and dance. The music was wonderful and the dancers very entertaining. The littlest dancer was about 4 years old and she took a real shine to Royce, talked to him most of the night. Royce couldn't understand what she was saying but it didn't stop her from talking to him. It was very cute watching Royce trying to communicate with a 4 year old that didn't speak English. They even got me up on the dance floor. We had a great night out but then we had to return to the Hostel the tour had booked us into. It was a small dark (the lights didn't work in the room) very cold room. The only light we had was from the bathroom light so there was no reading our selves to sleep. The room was not heated and was very cold. They did rent hot water bottles for a $1.00 if you wanted. 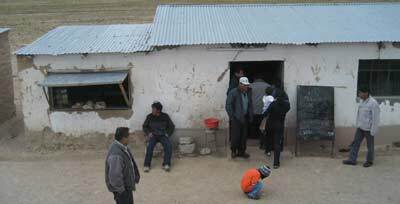 Now we know why they only charge $8.00 a night for the room.. After the trip to Colca Canyon we spent one night in a nice warm hotel room then got up early and took the bus to Puno Peru. 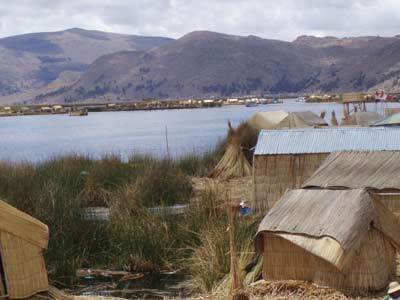 This was our next adventure Lake Titicaca. 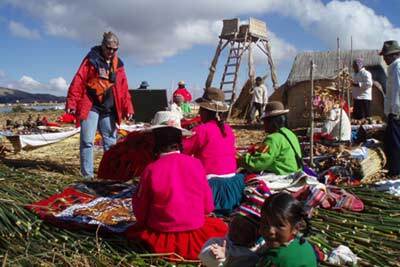 Lake Titicaca is in the southern most region of Peru. It borders with Bolivia. 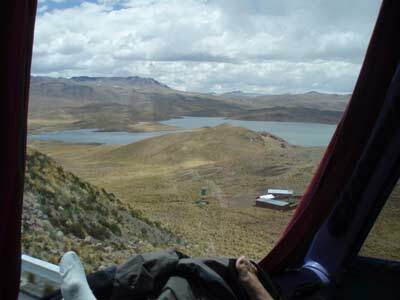 The trip from Arequipa to Puno was done in a first class bus. We had the 4 front seats on the upper floor. This was the lunch break stop. The local McDonald. They even supplied a bucket next to the door so you could wash your hands. One of the first things we did upon getting to Puno was stop in an Internet cafe to get our emails from home. 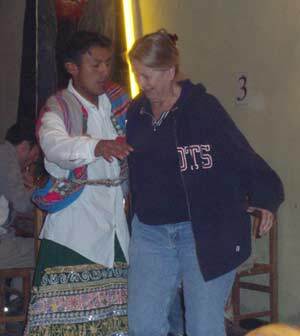 Once we got all caught up with family and friends we made arrangements for a tour of Islas Flotantes or the floating Islands on Lake Titicaca. 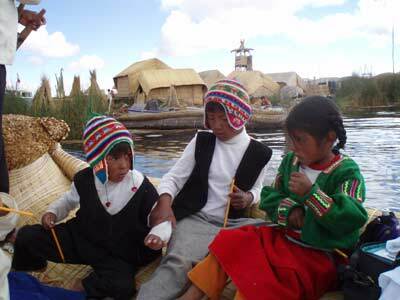 We took a twenty minute, tour boat ride to the floating islands made of reeds (the totora plant). 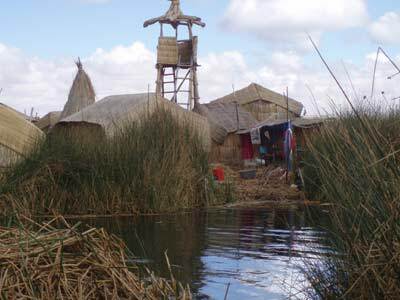 For generations, the Uros people have taken sods of soil and reeds and woven blocks together, stacked the reeds up and across to build three or four meter ground planes. On these man-made floating islands, entire villages live a simple existence without running water, electricity or plumbing. The totora is not only the building material and fuel for cooking, but it also a main staple of their diet, a reed vegetable that we peeled like a banana and ate. The flavor is fairly bland and the texture a softer version of celery. It is a vegetable fiber high in calcium and used for generations to care for their teeth, rheumatism and stomach ailments. For $5 solaces per person ($1.50) we took a boat ride from one floating island to the next, in a reed boat made from the totora reeds. 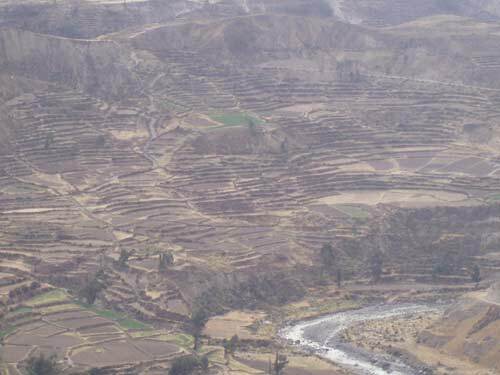 The Uroes people centuries ago wanted to isolate them selves from the aggressive Inca people so they built Islands built from reeds. The Islands (there are about 15) are all connected by ropes. They can move the Islands around. If one Island group gets up set with there neighbor they can move the Islands to a different area so they don't have to be next to the people they are mad at. Also is they are having a gathering they can rope all the Islands together into one big Island. They do this for the soccer games and party's. These kids came with us when we took a ride on one of the reed boats. Candy gave them pencils and took there pictures. They sang us songs. My personal favorite was twinkle twinkle little star in a mix of English, Spanish and Uros. The whole trip on the reed boat cost a dollar. That's not bad for a boat trip and entertainment. After Lake Titicaca we caught the bus for Cusco. 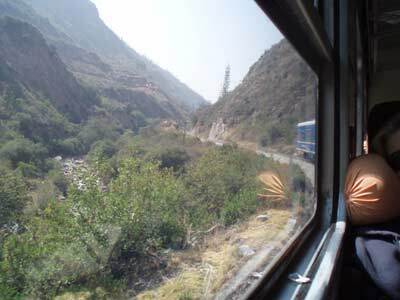 We stayed in Cusco one night then took the train on to Agua Calente. That's me sleeping thru the trip. Once we got to Agua Calente we found a room with hot water and a warm bed. On the way to dinner we met up with friends that had arrived a couple of days earlier. We had dinner then bought our bus tickets to the biggest ruins of all Motcu Picu. We spent the day going up hill and down hill. Add the hills to the fact that the air was very thin and boy I was really out of shape. I ended up setting and letting the other three go off exploring. I did make it to about the half way point. You can see the line of big windows in the middle picture. That's where I finally said I was done and set down. Even though I didn't go all the way to the top (see the picture on the left) the view was still amazing where I was. That evening we took the train back to Cusco and got our flight back home. The trip back to the boat went very smoothly and we where home that night at 10 pm. We had a wonderful trip but it sure was nice to get back in our own bed. We made it back to Ecuador with out any problems. Now we just have to get back in the groove and get some of the boat projects done. 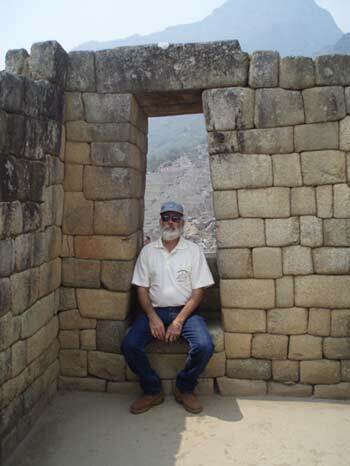 We plan to leave on our Peru trip Sept. 19th. Lots of stuff to get done before we leave. The biggest thing on the list is getting the yard crew started on stripping our water line so when we get back from Peru I can put a new water line on. We'll just have to wait and see if they get it done. 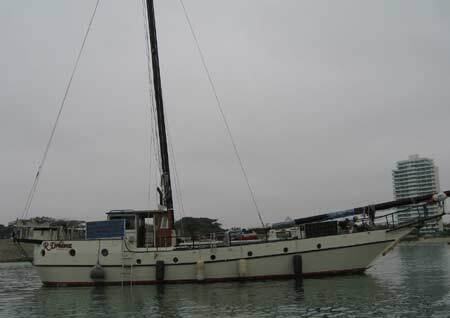 We will be going to Peru with Dave and Candy on S/V Endeaver. It will be fun to have friends with us as we travel. We have been in the States since July 17th. We are currently in Virginia visiting Royce's family. We spent 3 weeks with my family and had a great visit. The weather was warm and sunny most of the time. We even got to have a BBQ that everyone showed up for. Very cool. I even got a picture of the whole family. That has not happened in a long time. While I'm doing family pictures here's my kids. 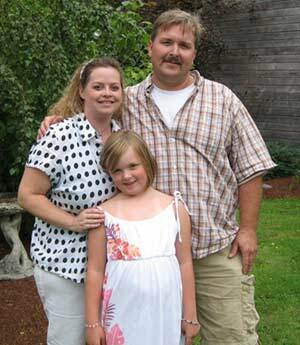 My oldest Brenda, Brett and my beautiful granddaughter Kaitlyn. 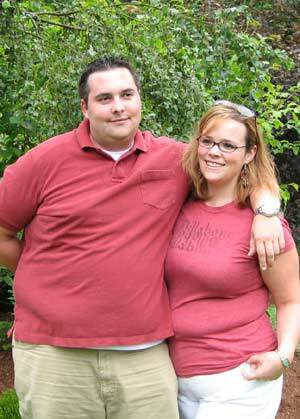 My son James and his Girlfriend Kelen. My baby Amber and my grandsons Taylor and Marcus. Note the bandage around Marcus's neck. He had just had surgery 2 days earlier to remove a cyst. The day after this picture he had to go back into the hospital for emergency surgery due to infection. He came thru that surgery very well and doing much better. We have been in the yard now since the 25th. 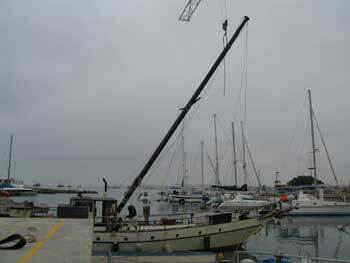 We arrived in Salinas on a Friday by Monday we had the forward mast down and the stern mast ready to be pulled. That was a lot of work in a short time but Royce does know what he's doing and it went like clock work. Here's some pictures of the process. 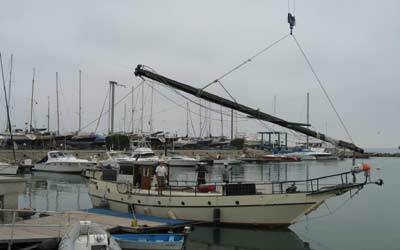 mast off and going to shore. RDreamz becomes a Power boat. After an uneventful 6 day passage we finally arrived at the Salinas Yacht Club at 10 am. The trip ended up being a motor trip as there just was no wind and we had a 2 knot current on our nose almost the whole way. We hope to get the masts pulled in the next couple of days and be on the hard by Monday the 25th. 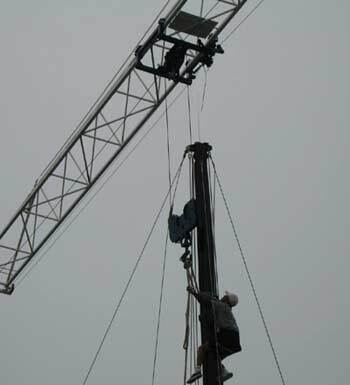 It looks like they'll have a place for us so if we can get the mast all down then we'll be set. There were a couple of rough spots along the way. we have finally left the Galapagos Islands. After 15 days longer then we had planned on being here we are headed back the the Ecuadorian mainland. It's 650 miles and should take us 6 days if the winds work with us. If they don't it may be longer. Here's a picture of the sun set our first night out. 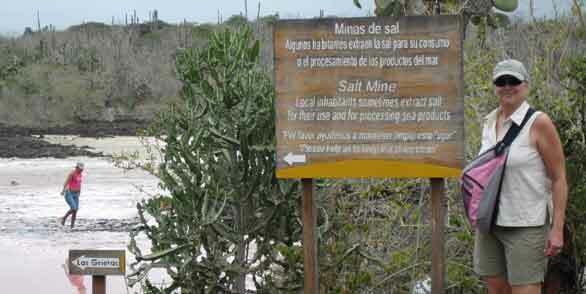 Today we made a trip to the Galapagos salt mine on Santa Cruz Island. We got a ponga taxi to take us over for the hike. The taxi's charge .50 each for the ride. The ponga's run 24 hours a day and we have not needed to take our dingy down since we have been here. The salt mine was about 1/4 of a mile walk from the point the ponga dropped us off. 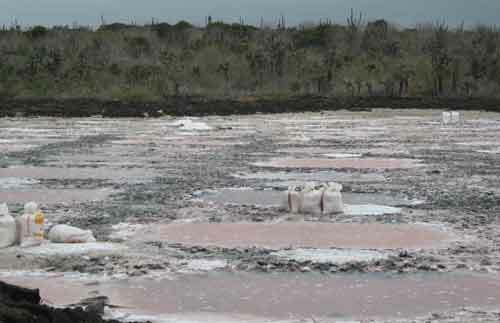 The mine is used by the locals for there salt needs as well as export to the main land. While we where there a lady and her husband where collecting salt for there own use. The lady was bare footed and used her bare hands to scoop the salt into a pile to dry. The piles that she had already done she then used a small bucket to put the salt into big bags for hauling. Later when she was finished and came to the bar to get some water we noticed that her hands had no finger nails and they where deformed from callaus's. It has to be a hard way to make a living. We asked what they use all the salt for and was told they use it to salt there fish. 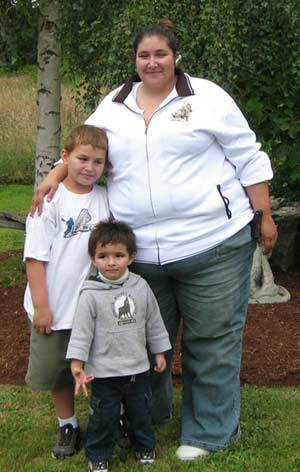 Her husband carried the filled bag's of salt to their boat 1/4 mile away. We asked how much the bags weighed and where told about 60 pounds. While we where there he made at least 20 trips with a bag of salt on his back. You can see the bags on the rocks next to the lady in the pink. Thats a lot of salt. Today I made my trek to the Port Captains office to see how long they will allow us to stay in Santa Cruz. We where finally given 15 days. We had hoped to be able to stop at one other Island on our way back to the main land but I was informed by the Port Cap. that due to our not having the $300. permit that you have to get before you get here we are only allowed to visit 2 Islands during our trip. It would have been nice to visit one more Island but we can live with what we have. It is a great place and we are very happy with the Islands we have visited. Here's a picture of the bay at Santa Cruz. We celebrated by going out to dinner at a very nice restaurant. You can see RDreamz behind Pams head. Our auto pilot has given out. We are 375 miles from the Galapagos Islands. It has taken us 4 days to get here. After Royce and I set down and discussed all our possibilities we have decided to turn around and go back to the Galapagos. There is just no way we can hand steer for the next 2300 miles. We really rely on the auto pilot to help us. With out it some one has to set at the well every min. and keep the boat on course. With the auto pilot we are able to set back and enjoy the trip. It's kind of like cruise control on your car but we can get up and go do things with out running off the road. We had several choices to make. Do we go back to the Galapagos and try and get parts? (not a good choice), go back to Panama? (800 miles down wind and current from the Galapagos) no way. That left us going back to Ecuador. Since we are going to have to go back to Ecuador we chose to go to Salinas as we can put the boat on the hard and do some traveling. It did not take us much time to decide that it would be nice to go back home for a visit. So the decision was made and we turned the boat around and headed the 375 miles and 4 days back to the Galapagos Islands. Today we left for the Marquesas. After a great 8 days in the Galapagos we have finally upped anchor and are on our way. Next stop Fatu Hiva 2890 miles away. The sky's are cloudy and there is no wind. We will motor till we get away from the Islands that are blocking the wind. We Finally arrived in the Galapagos Islands. First land fall Isla Isabella. After all the tacking back and forth we ended up doing 1300 miles to get hear. We where able to sail most of the way but it was an up hill battle. It was also a much longer trip then we had hoped for but all in all it was not a bad trip. The nights where filled with stars the days with calm warm breezes. What more can you ask for. Already here in the anchorage at Isabella where our good friends Judy, John, Gabby and Sammy from Enconto. It's been a good 6 months since we last saw them and it will be good to get all caught up with there lives. We hope to buddy boat with them to the Marquesas. After checking in with the Port Captain we where given a 7 day visa to stay on the Island. At the end of that we leave for the Marquesas. Any way we are here at last. 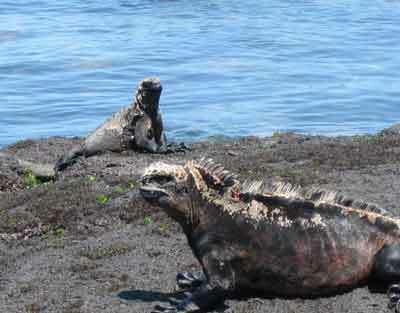 Isla Isabella is one of the largest Islands in the Galapagos. 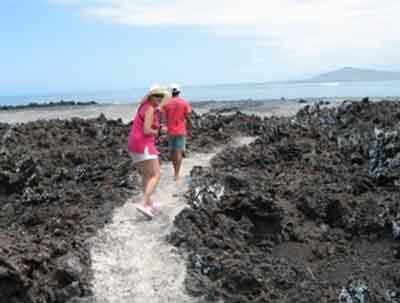 It has numerous volcanoes and you can walk on the cooled lava flows. It was necessary to hire a guide to go on hike. For $7.00 each our guide picked us up on our boat in his ponga and for the next 1 1/2 hours showed us sleeping sharks, seals, penguins and lots of iguanas. It was worth the $7.00 but would have been better if we could of used our one dingy and taken our selves. Just part of the very strict rules they have here on the Islands. Your not allowed to take your dingy any place but to the dingy dock in town. There is a very small village here on the Island. They have a small grocery store with very basic food stuffs. There is a butcher that I got some very nice hamburger from, also a very nice bakery that has the best fresh sandwich bread that we have had in a long time. One of the other tours we took was to the very end of the Island to see the Wall of Tears. This wall was built by Inmates that where housed on the Island at one time. The Inmates for punishment where made to construct a wall from rocks. The wall has no purpose and is in the most desolate area. I was told many inmates died from this punishment. Once you walk out to the wall and see the size and the weight of the rocks you can understand how bad it must have been. No shelter from the sun and heat. It was a very interesting walk and very thought provoking. On the way back to town we stopped at the beach to get some pictures of several very large Iguanas sunning there selves and swimming. We are still doing 2 to 3 knots. The sea's are still very calm and comfortable. We have some 3 to 4 foot swells but they are far apart and not to bad. We have seen a lot of lightning at night off in the distance but very clear and lots of star's where we are. So far we have only gotten 150 miles in 2 days. Not a good start. We had hoped for at least 100 miles a day. Maybe it will pick up. We are currently 728 miles from the Galapagos Islands. We have finally pulled up anchor. The winds are not working with us. At present there is no wind and flat calm seas. I hate to complain about the flat calm as it does make for a comfortable trip but with no wind we're not going any place fast. The best we have been able to do so far is 2 knots. At that rate we'll get to the Galapagos in 3 weeks or more. Not a good start for the trip. Finally we have left Panama City. At present everything is working as it should. It will be a while before I can down load web page up dates but I'll try and keep up with what's going on with us along the way. We will stay at the Contradora anchorage for a couple of days then we will go to the farthest Island Isla San Jose and spend our last night. It should be a 7 to 8 day trip if the winds work with us. If the winds do not work with us it may take us 2 weeks. Only time will tell. The on going saga of RDreamz. Royce and I got into the dingy to go to the Port Capt. office to check out. We got 2 feet from the boat when Royce found that the dingy cooling system was not working. If it's not working the motor will burn up. So we turned around and went back to the boat. the dingy motor went on deck and Royce started tearing it apart to find out what the problem was. The only thing he could find was maybe a clogged hose. but while he had it apart he checked for other problems and found that the thermostat was not working. We did a boil test on it and it was dead as a door nail. Well with out a dingy there was no way we could leave so we didn't check out and leaving this weekend went down the tube. Royce was able to hop in a cab and go to the water sport store that repairs dingy motors. They had just the right thermostat and Royce walked out $40.00 lighter. We had the dingy motor all put back together and running like a top by 4pm. It was way to late to check out so Monday I'll try the check out one more time and we'll plan to leave Tuesday. Oh well the boat is still a mess from doing the batteries so it gives me time to get that all cleaned up. The windows are done, the windows are done. I'm so excited. They're beautiful. Royce did such a good job. Just another reason why I love him. Royce does do good work. We have been trying to get these new tracks done for more then a year. The tracks we had, started to break down and were rusting. They looked terrible and I was afraid the window might fall out if a big wave hit it. We had tried to get new tracks while we were in Ecuador. Big mistake. We had a wood track made and the guy that did the work cracked one of the windows when he was working with it. The track looked terrible and then we were unable to get new safety glass. We now have beautiful aluminum tracks with new safety glass. The plan was as soon as the windows were in we would leave. I was just getting ready to go check out with the Port Capt. when Royce said I think we had better get new batteries. WHAT!!!!! Yep. Royce was checking the batteries before we left and found that 2 of the batteries in the house bank were dead, dead, dead. Since it's not advisable to replace 1 or 2 batteries we had to replace all the batteries. We did get lucky as they had the batteries in stock. There going to deliver the batteries today and Royce will have them installed by tomorrow. I will check out Friday the 20th. We plan to head out to the Perles Island to relax for a couple of days. Do some diving and just get ready for the long sail to the Galapagos Islands. The weather is good but there is very little wind so it may be a longer trip then we planned for but I have enough food on board to last 6 months so we're OK.
We went back to the states and had a great visit with both my family and Royce's. It was very cold and snowed a lot but we had a great visit. We did to go to the boat show while we were in Seattle. We had 'nt been to a boat show in 7 years so that was fun to do. 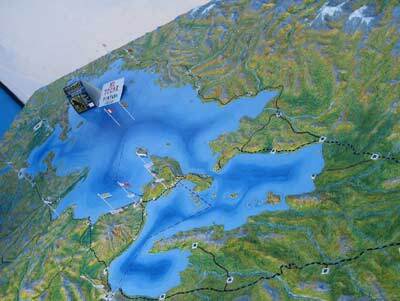 We were able to get a new Garmin chartplotter/radar. The radar we had was OK but we really wanted something more for the boat before we crossed over to the South Pacific. Since we returned from the states Royce has been installing all the new stuff we picked up while home. The radar is all installed and is very cool.. Some of the other things Royce has gotten done on the boat is installed and rewired all the solar panels. When we left they were up and running but not installed. Royce had a new stainless steel boarding ladder made. I'll have to take a picture of it cause it's beautiful. It's stainless steel and the welders did such a good job on it. Royce spent a lot of time getting all the details put together and it shows. It was good timing on getting the ladder as just last week I dropped the little portable boarding ladder we had over the side of the boat. Since we have returned from the states I have been busy sewing. I made all new screens for all the hatches and the pilot house doors. I repaired the main awning and put in more panels so there's more shade. We took the head sail down and I repaired all the rips, re-seamed and put on a new leather clew cover. The only thing left to do now before we leave is replace the tracks in the pilot house windows. Royce has been working on getting this done but as of yet still trying to figure out how to do it. We had hoped to be ready to leave for the Galapagus Islands on the 11th but the windows have to be done before we can leave so maybe next week. We have moved to boat to a mooring ball over in the Balboa anchorage. It took forever to get one and they are very , very expensive but if your going to be leaving your boat unattended this is the only way to go. We are going to be flying back to the states to visit family so the mooring was a necessity. 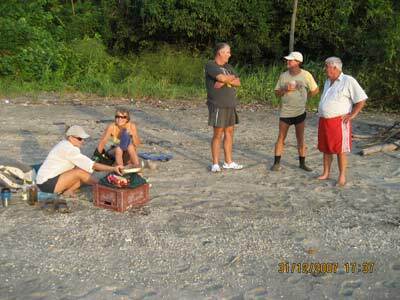 The last time we were Panama we where with several other boats and we all traded boat watching. It worked out great so we didn't have to pay for a mooring. This time all our friends have moved on to other places. That's the bad part of cruising. We make such great friends then we all go to different areas and never see each other again. Very sad, and hard to get used to. 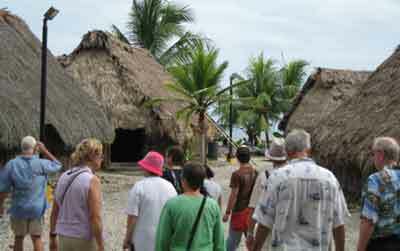 Another group got together and visited a Kuna village that was built in Panama City as a tourist attraction. They had a real village built and dancers in full costume. It was very commercial (lots of Mola's and baskets) but still very interesting. Making a mask. A group of cruisers got together and arranged a tour of the Presidents Palace here in Panama City. There was about 30 of us all together. We had to submit our passports last week so we could get a clearance to go into the Palace. Since we were going to be in the Old Town area we also did a walking tour of the area. We had not done this the last time we were in Panama so this was all new to us. Old Town is just like it says a very old part of Panama City. It's very run down but they are in the middle of refurbishing the old buildings. Let me tell you they have there hands full to refurbish this area. The buildings have a new Orleans feel to them. There are nice balconies over looking the street but I sure would not want to try and stand on any of them. The wood looked like it was ready to fall apart at the first step. There were several places that had been redone but very few for the large amount that needs to be done. The Presidents Palace is not so much a Palace as an old building that has a great history and been maintained better then the rest of the area. We had to pass thorough a gate guard and then thorough another guard at the door. For all the guards the President does not live there and was not there while we were there. It's great to be back in the big city again. Shopping, shopping, shopping. I've been to Reba Smith (big grocery store) and Price Smart (like Costco). We have a full freezer and all stocked up on food again. Life is good . The last time we were here ,there was a sloth that lived in the trees in the parking lot. That sloth is now on the missing list. We hope that the Smithsonian park that is next door to the La-Playita anchorage picked it up and put it in their park. No one seems to know for sure. This picture was from our last time here. 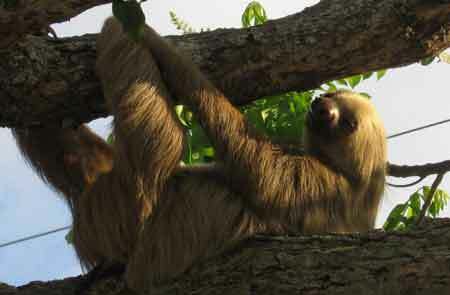 This is a 3 toed sloth. They sleep up side down during the day and start moving in the evening. They move in slow motion. It is very funny to watch as they move their legs in slow motion one at a time very, very slowly. It was a great day to head over to Panama City. The wind had died down. The water was smooth and clear. We upped anchor at 0530 so we could get there in plenty of time. With the winds and the current working with us we ended up getting to Panama City by noon. Way ahead of schedule. It was a great day. The winds were 15 to 20 knots but were mostly on our nose. We ended up motor sailing for a smooth ride. The current was with us so we were doing 7 knots almost the whole way there. We anchored at the La-Playita anchorage. There are a lot of boats here. We ended up way out side of the anchorage, out by the shipping lanes. It's a bit rolly out here but still not bad. There are only a few boats here that we know , Soy Libre (Andy, Maryanne, and Andrew), Iwa (Jack and Hermie), Libre ( Chewy and Susan). 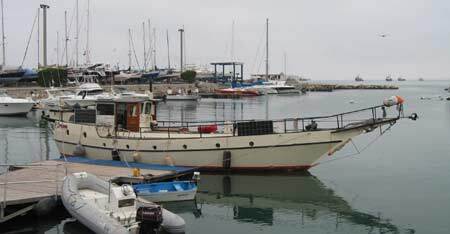 There are several boats we know over at the Balboa anchorage so we'll meet up with them later. For the time being we will stay here. We need to get a mooring ball so we can leave the boat to go back to the States. We have a reservation at Balboa or maybe we can get one here at Amador. We are still at Isla Contradora. The winds have picked up some so we are still staying on board. It sure would have been nice to go snorkeling or do a dive. Oh well next time. The anchorage now has only 8 or 9 boat left. It really got quiet once everyone left. We plan to up anchor in the morning and head over to Panama City. If the wind is going to continue there's no sense staying here trapped on the boat. Maybe by this weekend I'll have gotten a Mc Donalds hamburger. Wow what a great year we have had. We have seen some wonderful places and met a lot of great people. I could not hope for a better life then being a cruiser. We currently are at anchor at Isla Contradora. There are a least 30 other boats here. Contrdora is where the rich and famous of Panama come to enjoy the water. The Island is full of their big beautiful homes. At present there 6 mega yachts in the anchorage. Most will be leaving today or tomorrow. The Island also has a small air port and the planes have been going in and out all day. I think by tomorrow it will only be cruisers and a few local left. The weather has been sunny and hot. It would be perfect except the wind has been howling. We had hoped to take the dingy out exploring but the wind makes it choppy and not as much fun when you keep getting hit in the face with salt water. So we'll just set on the deck and watch all the other people. It's good to just take a seat an watch what other people are doing. The Mega Yachts are so close that we get to watch all the rich folk having a good time. Kind of interesting. If they have kids there's always a nanny one step behind the kid. 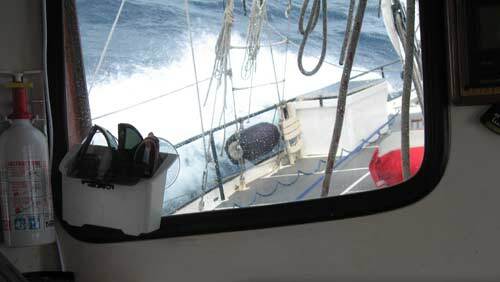 There's always a deck hand there to help them aboard. The one thing about the rich..... they have to go back to work.Heeeeeee. It's good being a cruiser. We don't have anyone there to help us aboard or take our lines but we don't have to leave at the end of the weekend to go back to work.